The problem with pocket knives isn't the blade -- it's the handle. Built for the pocket rather than the hand, the folders always find ways to be painful if used as a long-term work tool. With too many liner edges, not enough grip, and possibly even a pocket clip if you buy a modernized version, extended work with a pocket folder is a blistering experience. The traditional carver's knife was much simpler -- a small fixed blade knife with a large wooden handle was one of the most common tools on the workbench when most things were still made by hand. Not many woodworkers today know about Sloyd knives or chip knives, or take them seriously. Designed by a woodcarver who shifted into the woodcarving tool business, these four carving knives feature short blades of high carbon spring steel fixed in solid ash handles. 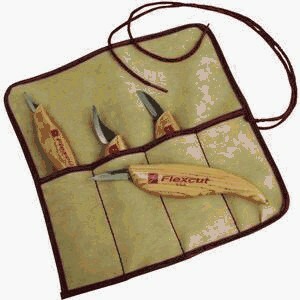 Unlike the straight grips of traditional sloyd and chip carving knives, the sculpted handles of the Flexcut knives fit the natural shape of the human hand. With enough diameter to provide excellent twisting leverage, the combination of large grip and small sharp blade makes the knife an extension of the hand. With less tension required for holding the knife, cuts become more accurate and the work is less tiring. Two straight blades for outside cuts and two pelican blades for working hollowed areas offer sculptors and whittlers many efficient options for both roughing out shapes and refining details. A four-pocket tool roll is included.